When it was lost on February 17, 1864, the H. L. Hunley was the first submarine to successfully sink an enemy vessel. 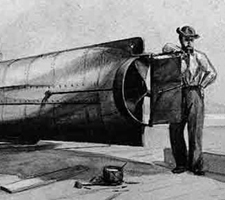 Surprisingly, the Hunley, named after its inventor, Horace Lawson Hunley, would not be raised from its resting spot in 1864 until 2000, nearly a century and a half later. Powered by a hand-cranked propeller and shaped from custom parts, the 40-foot submersible was operated by eight crew members. Seven of the crew worked the crank to turn the propeller while one crew member steered. The vessel utilized ballast tanks that were flooded by opening valves and then pumped dry with hand pumps. There were several iron weights attached to the hull for extra ballast which could be removed during an emergency if a crew member unscrewed the bolts from inside the submarine. The two watertight hatches were located on the forward and aft portions of the ship atop the conning towers, both of which were equipped with small portholes. The hull totaled around 4 feet 3 inches in height and required the crew members to constantly stoop their heads during use. After an initial demonstration in Mobile Bay, where the submersible attacked a flatboat, it was deemed ready for military use and was put on a train and sent to Charleston, South Carolina. Plan of the Hunley showing both conning towers and hand-cranked propeller. The submersible was plagued by bad luck from its first missions in the Confederate Navy, in which it was sunk on two separate occasions. 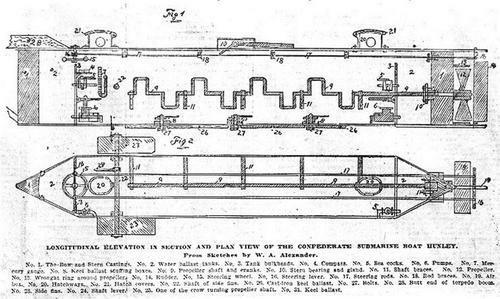 On its first training mission in August of 1863, the submarine’s crew was still learning the procedures for a test dive when the Skipper, Lieutenant John A. Payne of the Confederate Navy, stepped on the lever in control of the diving planes. The ship dived immediately while its hatches were still open and submerged too rapidly for most of the crew to escape. Only two crewmen and Payne swam out of the flooded submarine which then was raised by the Navy. In October of the same year, Horace Hunley wished to command his vessel through another exercise to instill confidence in his invention. Despite his precautions, the sub dived during the exercise, but did not surface for reasons unknown. Unfortunately, Hunley died as well as the whole crew and the ship was raised once again. In February of 1864, the salvaged Hunley set out once more on what would be its last voyage. It had one mission in mind: to ram the Union Navy blockading Charleston’s harbor. Its victim would be the Union sloop, the USS Housatonic, guarding the entrance to Charleston’s harbor. The Hunley completed its mission ramming and sinking the USS Housatonic with its spar torpedo, a copper container filled with 90 pounds of black powder and attached to a wooden spar approximately 22 feet long. While it is still a mystery as to why the Hunley sank, its legacy lives on as the first submersible to destroy a ship.